I'm searching job offer, which can make from home. If you find and share link to websites (minimum 3) with jobs offers and your website will be best for me, you will be winner! If your website doesn't included all expects from "job offer" and "job offers website" (see up), please don't share this link. Fiverr and Upwork doesn't fulfill conditions of this job. Please, read the conditions and try to share other links. Thx! I'm afraid not. 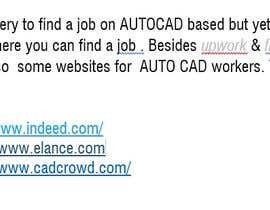 #1 careerjet - there is not enough jobs offer "AutoCAD" & "home based" or "remote", #2 technojobs - there I cannot search "CAD" and "home based" in same time, there is a lot of jobs offer for CAD but I cannot filter for "home based", #3 indeed - as I wrote I don't accept this website. Please, read the rules of this job and after that try to share others links. Thx! I add comment to your screen. Please, share all links and respect rules for this job. Thx! where are your link ?? It was in first post by Mohammed B. look up. Only one link to indeed.com isn't, what I expect. Please, read my explains and after that try share new links. Thank you!